This is a commissioned painting for a friend of mine named Joshua Pauley. 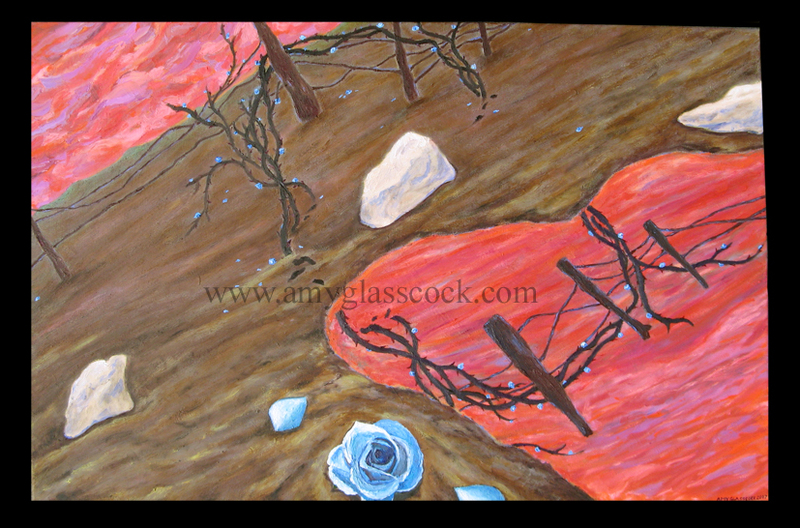 He came to me with some symbolic ideas that inspired him and asked me to put them all together in a painting for him. 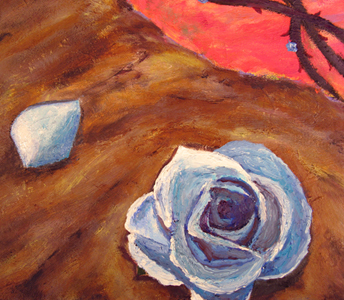 Some of the symbols included a blue and white rose. The blue was to represent mystery and the white was to represent innocence, purity, reverence, and humility. Also he wanted a crown of thorns to represent the idea of Jesus' sacrifice and also a flame burning an orangey color to represent passion and the holy spirit. So this painting is what I came up with as a result. I added some other symbols in there as well such as repetition of the number 3 representing the trinity. I also liked the idea that the viewer is looking at the ground, in a sort of humble and prayerful gesture as they look at the dust of the earth. The same dust that God made us from and the same dust that we will one day become, while at the same time the viewer glances at the reflection and sees the crown of thorns. I like the word play as in a sense the viewer is reflecting on the meaning of the crown of thorns. See Joshua Pauley with his new painting!